The Route 340 bridge, which spans Miller’s Run in Salisbury Township, Lancaster County, reopened to traffic at around 12:30 PM this afternoon. This bridge was replaced as part of the Pennsylvania Department of Transportation's (PennDOT) Rapid Bridge Replacement Project and allows PennDOT to remove it from the state's structurally deficient bridge list. The bridge was closed on September 25 for the replacement project. With the bridge reopened, motorists may notice a slight bump as they drive across the bridge until a polyester polymer concrete (PPC) overlay is applied to the deck. This is often the final step in completing box beam bridge projects. The PPC overlay is designed to protect the deck from the wear and tear brought about by Pennsylvania’s harsh winters and reduce the long-term maintenance costs. This bridge is referred to as JV-257 and is one out of the 558 bridges being replaced under the Rapid Bridge Replacement Project. JV references the joint-venture partnership between Walsh/Granite, which is leading construction for the entire project. 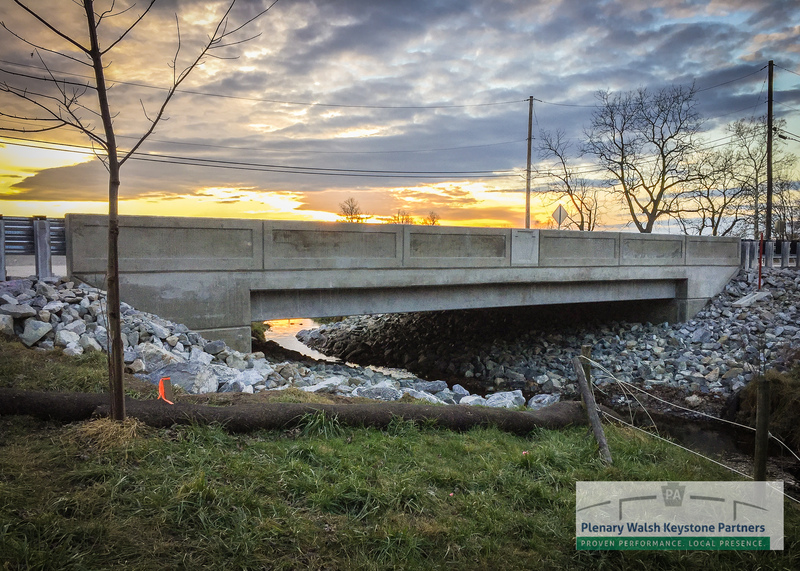 Replacement work for this bridge was performed by Walsh Construction II.